Peter was born in Redruth in 1962 and grew up in St. Austell where he went to school at Charlestown, Poltair and St. Austell 6th Form College. . He was converted in 1982 in Cardiff while a student (his one and only year at university!) and was baptised and become a member of St. Austell Baptist Church later that same year. He studied at the Bible College of Wales in Swansea, joined WEC International in 1988 and has been in Japan since 1990. Peter met Edi when he worked for a year at Emmanuel Grammar School, which was attached to the Bible college. She was born in Japan where her parents were also WEC missionaries. She trained to be a teacher in Worcester and then studied at Hebron Bible Institute in Japan. She has been in Japan as a WEC missionary since 1993. Pete and Edi with their three children lived near Lake Biwa in the centre of Japan where Pete pastored the Kaori Christian Church,. 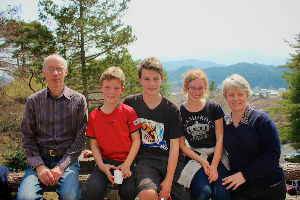 The children all attended the local Japanese school where Edi taught elementary English and Pete gave English lessons to local children in the local community hall.Joanna, Andy and John, their children, were all born in Japan and attended Japanese Primary School. They speak Japanese more naturally than English and it was a constant battle to get them to speak English while they were at home. They were in a Japanese world from 7.50am to 3.30. In 2011 the family moved to Kyotanabe. Joanna and Andy now attend the Kyoto International University Academy and John has moved to a new Japanese Primary School. Pete still acted as pastor at Kaori church travelling back two or three times a week - about an hour's car journey. In June 2012 Pete and Edi's work at Kaori came to an end . The church is now pastored by Ron and Yoshimi Caseley, WEC missionaries from New Zealand and Japan. 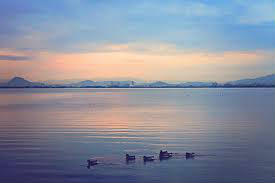 Shiga-cho. The town had no church until 1999 when the SCENT team started working here." Together with Simon and Henrietta Cozens (UK), John and Samantha Tan (Singapore) and others, Pete and Edi are part of the South Kusatsu Team working to plant churches in this area. Pete still conducts Christian weddings and attends a Japanese class. Edi teaches art twice a week at KIUA. Joanna is in her last year at school. Within WEC Pete has become the chairman of the SFDK (The WEC-connected church group in Japan) education committee. He will also be giving seven lessons on world mission at Kansai Bible College between April and June 2014 for the first time. Please pray that others will come back as long termers. The field has a need for more workers. When new workers come to the field we are responsible for overseeing their language study.